On Thursday, this year’s five-day East Neuk Festival opens with a daredevil act. In her late-morning solo recital, the young, up and coming South Korean pianist Yeol Eum Son has chosen a programme that would scare the pants of even the most seasoned professional. So what’s this early 20th century musical Molotov cocktail all about? It stems from Yeol Eum’s fascination with all things written between 1910 and 1920, a war-torn decade, she says, when times were harsh. “When that’s the case, people become so much more creative. Out of adversity comes music that is so challenging, so productive. That’s what I’m trying to convey in this programme.” It’s also important, she says, to note that all three composers knew each other. This is Yeol Eum’s Scottish debut, though the electrifying programme has been tried and tested in the United States and elsewhere, so what we’ll hear is a seasoned product. By nine, she was having occasional lessons from top teachers in America, but her move to Germany marked a watershed. After years of grounding in the mechanics of being a pianist in Seoul, her studies in Hannover introduced her to “the abstract things” – how to interpret, how to communicate her deepest thoughts. In fact, she won second prize in the prestigious Russian competition, and the way was open for a burgeoning career. 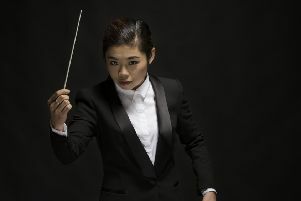 Invitations came to appear with major orchestras – the New York Philharmonic with Lorin Maazel among the first – and Yeol Eum’s recital schedule grew like Topsy. Her career is still in the ascendant, so Scotland is hearing her at the most exciting time. These days she alternates her home between Hannover and Seoul. I spoke with her during an extended stay in South Korea, where she is gearing up for her maiden programme as artistic director of the PyeongChang Music Festival & School, a post she took up in March following in the footsteps of fellow South Koreans, Myung-Wha Chung and Kyung-Wha Chung. “I’ve really enjoyed programming pieces I don’t play myself,” she says. But it’s East Neuk Festival artistic director Svend Brown’s festival programme in Crail that will introduce Yeol Eum to a Scottish audience – and she’s in great company. This year’s festival features another great pianist, Christian Zacharias, as soloist, chamber musician, presenter and finally as conductor with the SCO in the closing concert on Sunday week. Then there’s a series covering all six of Bach’s wonderful cello suites, played by Jean-Guihen Queyras in three different East Neuk locations in the space of a single day (29 June). There will be performances, too, by the Castalian and Elias String Quartets (including a new work by Pullitzer prizewinner Caroline Shaw), The Tallis Scholars and guitarists Thibault Cauvin and Thibaut Garcia, as well as some stylistic cross-fertilization from folk fiddler Duncan Chisholm with the Elias Quartet, and bassist Renaud Garcia-Fons with Derya Türkan on the Turkish kemençe. Fife will rarely have felt so international.